How Do Rotarians Help Resolve World Conflict? 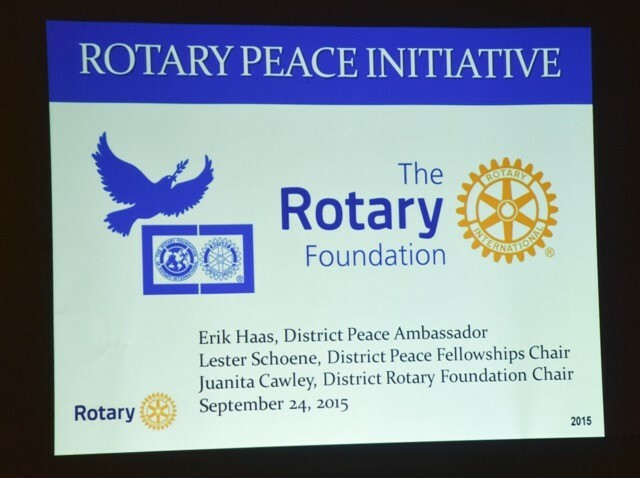 The Rotary Club of Leesburg was honored to have a program presented by District leadership team members: Past District Governor/District Foundation Chair Juanita Cawley, District Peace Ambassador Erik Hass, and Peace Fellowship/conflict resolution expert Lester Schoene, Jr, on Sept 24, 2015. They shared important information about conflict resolution and peace initiatives, including the Rotary Peace Fellowship, the Rotary Peace Center, and World Peace Day. The theme of this year’s International World Peace commemoration is “Partnerships for Peace – Dignity for All” which aims to highlight the importance of all segments of society to work together to strive for peace. Test Your Knowledge: What year was the first annual International Peace Day observed? People were listening to Abracadabra by The Steve Miller Band and John Cougar's Jack and Diane, too. E.T., a Spielberg science fiction movie, was released that year and was a box office hit...with cute little Drew Barrymore.